Are you looking for a cheap car hire in Picton? VroomVroomVroom can help you find a reliable yet affordable rental car. We compare vehicles from major brands such as Avis, Budget, Europcar, Hertz and Thrifty. Just fill in your preferred dates and start comparing prices instantly. Picton is at the top of the South Island and is the departure point for the Cook Strait Ferry service. It is the service town for the Marlborough Sounds and gateway to the Queen Charlotte Sound. The city has one-fifth of New Zealand's coastline at its doorsteps. There are plenty of beautiful places to visit on a trip from Picton's waterfront jetties. Why book a car hire in Picton at VroomVroomVroom? Wide selection of cars. There are plenty of cars to choose from in Picton since we compare the vehicles offered by various brands. Excellent customer service. We have been helping people book a rental car since 2001. ​ Contact us if you have any questions or need any assistance. Great rates. We have negotiated with our partners so we can provide the best price. Our Price Promise can help you find a great deal. The weather in Picton is generally fine throughout the year. October to May is a popular time to visit the area. There are plenty of events to attend, like the Marlborough Food and Wine Festival in February. 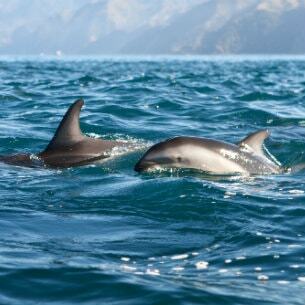 If you're interested in seeing dolphins, Picton is a great place to go. Sail through the Cook Strait with the Bluebridge Ferry service. You may even catch glimpses of dolphins or whales. E-Ko Tours offer a wonderful wildlife cruise through the area. We've put all the info you might need on Cook Strait Ferry travel in one place. Vehicles aren't insured on the ferry. Companies will ask you to leave your vehicle in Picton and will find you a replacement in Wellington. They may consider this a 'continuous hire' and let you put both cars under one-contract. Our expert customer care team can answer any questions on this. They can also recommend the most affordable deals for your trip. is it your first time to drive in New Zealand? Click here for some useful driving tips. Kick start your South Island holiday in comfort by getting a car rental in Picton. With a car hire, you can explore the wonderful scenery that the town and the rest of the South Island has to offer. The unspoilt beauty of the Marlborough Sounds is right on the doorstep of Picton, and the wine country of Blenheim is just up the road! Fun fact: with both the Marlborough and Queen Charlotte Sound as neighbours, Picton has access to one-fifth of New Zealand's coastline. Getting on the water from Picton is very special, the ocean is crystal clear and home to more than five species of dolphin. The Queen Charlotte Track is a unique experience which combines coastal views, the mystique of the Marlborough Sounds, and native bush. You can explore the track by walking, biking or cruising, with your pack transferred to each night's accommodation. Traversing the track can take between 1 and 5 days. Before you begin your adventure, it is best to seek assistance from Wilderness Guides. 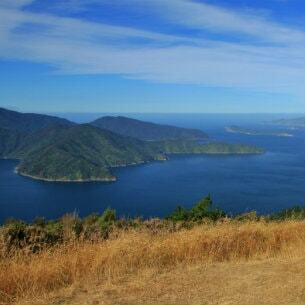 Their Queen Charlotte Track specialists can arrange guided walking and hiking packages that will suit your budget. If you are searching for the best walking tracks around Picton, then professional hikers Steve and Juliet Gibbons of New Zealand Walks can help you with that. The Kiwi hikers have been providing guided as well as independent walking tours in South Island for more than 15 years. Their experience and knowledge is guaranteed to make your adventure memorable. Whether you are exploring Queen Charlotte Track or strolling along the Abel Tasman Coastal Track, you know you are in good hands when you've been guided by New Zealand Walks. Have you ever wanted to pet a penguin? This is possible when you visit EcoWorld where you can get up close with adorable Little Blue penguins and other amazing animals such as the ancient tuatara, red eared turtles, and red crowned kakariki. You can also see different species of fish in their main marina tank. EcoWorld's knowledgeable and friendly staff are ready to give you an intimate and memorable experience. For the ultimate wildlife, wilderness, and water adventure, make sure to get in touch with E-Ko Tours, which was formerly known as Dolphin Watch & Nature Tours. They offer tours that would get you closer to the wildlife and enjoy the picturesque views via scenic cruise. Their highly-experienced guides and skippers always do their best to provide best views of dolphins as well as fur seals and seabirds. If you are lucky, you may even see the largest dolphin species called orca or also known as the killer whale. Being home to the ferry terminal means that Picton is the gateway for inter-island travel in New Zealand. The ferry between the two islands will carry passengers and vehicles, and is considered one of the world's great scenic water crossings. As hire cars are not insured when travelling on ferries, your car rental company will ask you to leave your car on one side of Cook Strait, and arrange a replacement car after the crossing. So relax and enjoy the cruise, with a break from driving and a chance to enjoy the scenery. Enjoy spectacular waterfront location at Bay Vista, which is located in Waikawa Bay and just 5 minutes away via car hire from the Picton/Wellington ferry terminal. The town centre is also nearby thus making it easier to explore other attractions. There are several accommodation options to choose – ranging from one bedroom units to four bedroom apartments. This motel is the perfect refuge from exploring the Queen Charlotte Track and Marlborough Sounds. Stay close to the beautiful Picton Harbour when you book your accommodation at Harbour View. The motel is just a stone's throw away from the Picton village and a great selection of restaurants and cafés. All of their studios and apartments offer breathtaking views of the harbour, marina, and the spectacular landscape. If you prefer more privacy, you can stay at their off-site waterfront apartment which is situated beside the Irish pub and has fantastic views of the Queen Charlotte Sound. With such a long name you would expect big things here. If you're a nature lover, you'll find this accommodation location that extra bit special. The centre allows visitors to interact with bird species and geckos and be inspired by the fauna and flower species located in the Marlborough Sounds. Its the perfect holiday retreat location. This renovated historic villa is the town's smallest hostel offering beds for only 16 people. With its central location, it's an easy 10 min. stroll or 3 min. drive to town. Priding itself on an atmosphere which can't be beaten, you'll see why it has a 99% positive review rate. The Huffington Post featured it as one of the 12 most awesome hostels in the world. Worth seeing what all the fuss is about. But get in quick. This award-winning bakery is owned by a Dutchman and his Kiwi wife, and with their home based knowledge have created the best reputable artisan breads, tasty sweets, satisfying savouries, healthy filled rolls and delectable, filling meat pies. It has everything that is expected to be found at a bakery, only better! Using the best of seasonal and local produce, you'll have the finest quality for your money at this cute cafe. Not only does it offer good food with a spectacular view, you'll be delighted with live music performances to make your experience that extra bit special. Avis Picton Ferry - Ferry Terminal Building, Picton, SI. Budget Picton - Picton Ferry Terminal, Picton, NI. Europcar Picton City - Booth 8, Ferry Terminal, Picton, SI. Hertz Picton Ferry - Inter Island Ferry Terminal, Picton, SI. Thrifty Picton Ferry Terminal - Terminal Desk, Picton Ferry Wharf, Picton, SI.